NASHVILLE - Last weekend's deadly violence by white nationalists and supremacists in Charlottesville, Va., over the removal of a Robert E. Lee statue drew as many as 100 black and white demonstrators to Tennessee's state Capitol on Monday where they demanded removal of a bust of Confederate Gen. Nathan Bedford Forrest. "Goodbye Nathan Forrest, I'm going to let it shine," the group sang regarding Forrest, an early leader of the Ku Klux Klan. The Forrest bust for years has been situated on the second floor of the Tennessee Capitol outside the House and Senate chambers. Efforts to remove the Forrest bust backfired several years ago when the General Assembly instead passed a law in 2016 making it harder to remove historical statues or monuments named after controversial figures. The law requires two thirds approval of the Tennessee Historical Commission before such monuments are removed. The Tennessee demonstrators later went down to the state Capitol's first floor where they demanded to hear from Republican Gov. Bill Haslam, who didn't appear to be in his office or even the Capitol at all today. 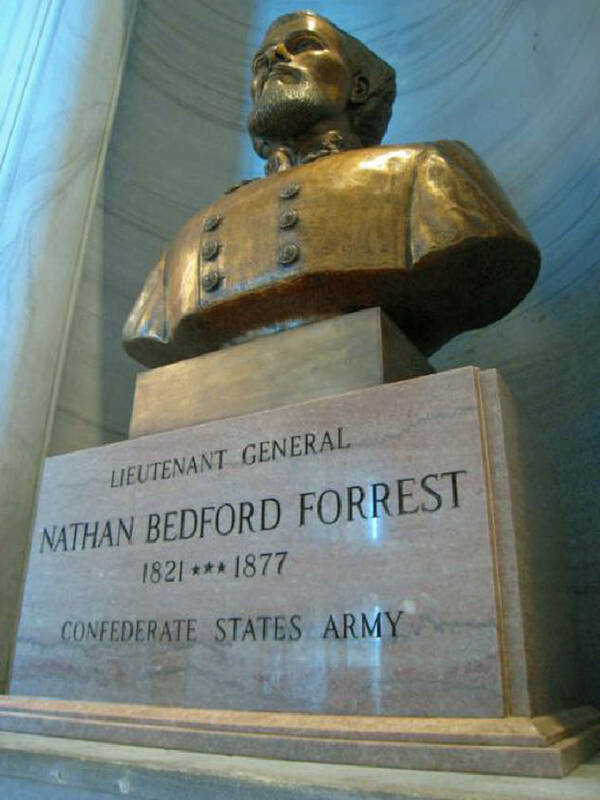 In a later statement, Haslam said "my position on this issue has not changed – I do not believe Nathan Bedford Forrest should be one of the individuals we honor at the Capitol." Haslam added that "the General Assembly has established a process for addressing these matters and I strongly encourage the Capitol Commission and the Historical Commission to act."